Griff, an American Labrador Retriever, is a trained therapy dog as part of Therapy Dog International's Tail Waggin' Tutors program, and he listens to boys and girls read books. He'll be here on Wednesdays from 5-6pm. Studies show that therapy dogs calm students so that they can practice, gain confidence, and improve their skills in a relaxing environment. Parents can sign their children up for a ten-minute session of reading with Griff. Traveling Ohio: Where Can the Two Lane Roads Take You? Join Mike Hocker, President of the Ohio Byway Links and local Galion resident, for this 90-minute round-table discussion. Want to get away for a long weekend? Tell Mike where you want to go and he'll tell you what there is to see and do along the way! There is so much to see on the low roads. Call 419-468-3203 to register. Mon, Dec 3rd, 6:30-8pm. Get hands-on experience using a web browser to find information on the internet. This course will start you off on the ground floor and rocket you into the online world. We can only take ten people for this class, so sign up now. $2 reserves your seat. It's back. Our previous Bingo for Books games were so popular, we decided to do it again... just in time for the holidays. If you love books and Bingo, this is the place for you! Newly released books will be available to win, including much more non-fiction! If you're feeling lucky, call 419-468-3203 to register. Players are eligible to win a maximum of 2 books each. Thu, Dec 6th, 10-11:30am. 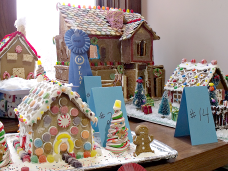 The pictures from our Christmas Open House and Gingerbread House Contest are up in the photo gallery. Children of all ages, come to the library and make holiday crafts that you can take home. Registration is not required: you can just come in at any time during the day. Wed, Dec 26th, Thu, Dec 27th, and Fri, Dec 28th. Join us Tuesdays at 6:30pm for stories, crafts, and lots of fun. Join us Wednesdays at 10:30am for stories, crafts, and lots of fun. The library will be closed in observance of the holiday. Watch an animated feature film on our big screen. Popcorn and punch will be provided. Bring your own blanket and pillow. For grades K-6. Stop by the children's room to find out what movie we'll be showing (or maybe some will-o-wisps will lead you to it). Fri, Dec 28th at 3pm. You won't want to miss being a part of these lively book discussions. Contact Cyndi for more details and to find out what the Book of the Month will be. Join us for a fun-filled afternoon of snow-day activities: stories, crafts, games, and hot chocolate. For grades K-2. Sat, Jan 5th, 2-3:30pm. Come out and support your favorite team and enjoy football-themed crafts and games. We'll have Wii Football and other fun football activities. Refreshments will be served. For grades 3-6. There is no charge for this program, but registration is required. Sat, Jan 19th, 2-4pm. Join us Tuesdays at 6:30pm and Wednesdays at 10:30am for stories, songs, crafts, and lots of fun. Discover the World of Tea through the teacup! In celebration of National Hot Tea Month, Lisa Belstein, owner of Lexington's Blueberry Patch, will lead a 1 hour tasting. Learn about some of Lisa's favorite teas as she takes you on this fragrant journey through the teacup! TWO different seatings available...4:30pm and 6:30pm. Those who attended last year, or know a lot about tea, may want to join us for the "advanced" tasting at 6:30pm. Call 419-468-3203 to register. The library is now accepting applications for a combined publicity and circulation position. Applications are available at the main desk. Must be creative and have good computer skills. Excellent communication skills required. Must be able to stand at a desk for extended periods of time. Must work well with the public. Prior experience with newsletters, graphic arts, displays and/or programming for adults desired. Familiarity with budgets desired. College education preferred. 15-25 hours a week. The Galion Public Library will be accepting non-perishable food products in lieu of cash for the payment of library fines during the month of February. All the collected food will be donated to a local food bank. For each can or box of food donated, $1 will be removed from your library fines. Remember...foods with expired use-by-dates and/or damaged items cannot be given to the local food banks and will not be accepted. Dress in your fanciest and celebrate Valentine's Day with our 2nd annual Fancy Nancy Tea Party. For grades K-2. Sat, Feb 2nd, 2-3:30pm. Come in any time during library hours for spring crafts to make and take home. You don't need to register for this: you can just show up. Ask at the children's desk for more information. Come out and create your very own race track to take home. Bring your own Hot Wheels car for racing, or use one of ours. We'll be having other race-themed crafts and activities as well. Refreshments will be served. For grades K-2. Call or visit the children's room to sign up. Sat, Mar 2nd, 2-3:30pm. Does mixing Mentos and Diet Coke really create a giant geyser? Is it really unsafe to mix Pop Rocks and Coke? We'll answer these questions and more. Dress to get messy. For grades 3-6. Call the library or visit the children's room to sign up. Sat, Mar 16th, 2-4pm. Come watch the movie on our big screen. Popcorn and punch will be served. The movie we will show is an animated feature film and is rated PG. Remember to bring your own blanket and pillow. For grades K-6. Call or stop by the library to sign up and to find out the movie title. (Saying it here would Wreck the licensing agreement that lets us show the movie.) Sat, Apr 6th at 2pm. Join us for an exciting afternoon of Star-Wars-themed activities, crafts, games, and a costume parade through the library. For grades K-6. Costumes are encouraged but not required. Parents are invited to observe the parade at 2:30. Space is limited, so call or stop by the children's room to sign up now. May the fourth be with you. Sat, May 4th, 1-3pm. 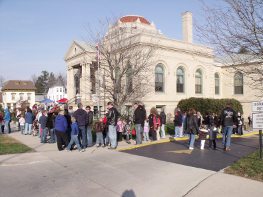 Come celebrate President's Day at the Galion Public Library. We once again welcome back Ken Hammontree of Living History Productions to present Harry Truman. Harry Truman was thrust into presidency on April 12, 1945. The decisions he made as president were some of the most crucial decisions in history. Hammontree will become Harry Truman and portray him in first person as we learn about how Truman was able to make these tough decisions. Call 419-468-3203 to register for this 1 hour presentation. Mon, Feb 11th, 6:30-7:30pm. Stop by and decorate a cake pop or two of your very own. We'll have other chocolatey-good activities as well. For grades 3-6. Call or stop by the children's room to sign up. Sat, Feb 16th, 2-4pm. Join writer Rachel Mendell in the 1st of 3 workshops that will be held at the Galion Public Library this winter. This workshop will focus on creating raw material for poems, stories, and memoirs. Infuse new life into a lagging project by using all the senses. Use sight, sound, smell, taste, touch, the sixth sense of the muse, and the seventh sense of randomness to open up new areas in the locked up closets of your mind. Call 419-468-3203 to register. Sat, Feb 16th, 10-Noon. Join Rachel Mendell in this 2nd of 3 writing workshops! This workshop will focus on how to create your raw material by unchaining your creator self from your editor self. This will be done through several 5-10 minute writing exercises. Create short fiction, resurrect forgotten memories, start a new project and allow your mind to surprise you. Please call 419-468-3203 to register. Sat, Feb 23rd, 10-Noon. We have finally scheduled our spring computer classes. Check the schedule for details or stop by the main desk to sign up. Join Rachel Mendell for her final workshop at the Galion Public Library this winter. Unlock memories as simple every-day objects are used to open doors that have long been shut. Then, learn tips on making a memory into a story. This workshop has been REVISED. If you attended in the past, you won't want to miss this year! Please call 419-468-3203 to register. Sat, Mar 9th, 10-Noon. Bring your favorite board game or card game and a friend. We'll bring the refreshments. If you don't have a game to bring, you can play one of ours. For grades 6-12. Registration is not required: you can just show up. Thu, Mar 28th, 6-8:15pm. Come experience one of your favorite movies in a whole new way. We will be watching The Hunger Games with hilarious audio commentary from the funny guys at RiffTrax . We got special permission for a single showing, so don't miss it. Doors open at 7:15, and the movie will start at 7:30pm. For grades 7-12. Registration is required: stop by the main desk or call to sign up. Fri, Apr 5th, 7:30-10pm. Who will be our next chess champ? Test your chess skills in our four-round Swiss-system tournament, with no eliminations. Points are assigned to each player's win, loss, or draw, and the player with the highest score wins. Participation prizes and prizes for the three highest scores will be awarded. Please eat lunch before you come and plan to arrive by 11:45. Snacks will be provided during the afternoon. There is no cost to enter, but registration is required. For grades 6-12. Sat, Mar 23rd, Noon-5pm. The library association will hold its annual meeting in the Community Room. Membership in the Galion Public Library Association is open to the public. If you are interested in joining the association, speak with the Director. Mon, Apr 8th at 7pm. 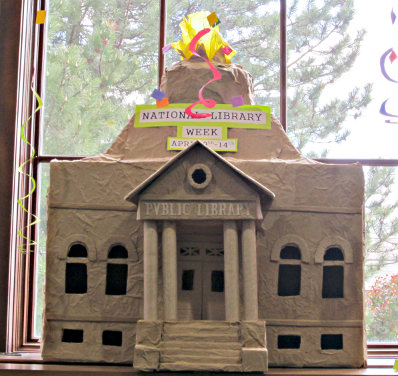 April 14th-20th is National Library Week. Join us the second Thursday of each month for anime, manga, Japanese culture, graphic novels, and more. For teens in grades 7-12. Cosplay is optional. New members are always welcome. There is no need to register: you can just show up. Summer reading starts June 1st. We'll be giving away hundreds of dollars worth of gift certificates to local stores and restaurants in our weekly prize drawings. We'll also be hosting a number of special programs. Watch this page for more details. Our Summer Reading program is coming up in June. Read books, win prizes, and come to our special programs. Watch this space for more information. Summer Reading is coming up in June. Watch this space for more details. Join us for our annual party on the lawn in celebration of summer reading. We'll have crafts, games, and other fun activities. (If it rains, we will still have indoor activities.) Watch this space for more details. Wed, Jun 12th, 1-3pm. The Cookbook Club meets again, this time to celebrate the start of the season of fresh vegetables! All are invited to bring their cookbooks (to show off or to trade) and a salad to share. We will meet in the Community Room. Registration is required for this free event. Tue, May 28th, 6-8pm. The Friends of the Library will be holding their spring book sale. Proceeds will benefit the library. We're bringing back our popular summer writing series, conducted by Rachel Mendell. These workshops do require registration, but there is no cost to attend, and refreshments will be provided. Sign up at the main desk. For our 4th Annual Poetry Contest, in honor of National Poetry Month in April, we encourage poets aged 18 years and older to submit one original poem for a chance to win a prize. Submissions may be dropped off during regular library hours throughout National Library Week: Monday, April 15th — Saturday, April 20th, 2013. Submitted poetry must be: 1) an original creation of the submitter; 2) typewritten; 3) no more than 40 lines in length; 4) never previously published. Poems will be judged on thoughtfulness, grammar, tone, creativity, style, and appearance. No additional artwork, please. Winners will be announced by Monday, April 29th. Prizes will be awarded for 1st, 2nd, and 3rd place poems. Winning poems will also be displayed at the library and on our web site. First Place: Lady on the Bottle by Matt Echelberry; Second Place: Iberia School: Fall, 2011 by Bonnie Hildebrand; Third Place: Give me Things that Money Can't Buy by Margaret K. Leapley. Come to the library to see the winning poems on display. Contest entrants who wish to pick up their judging sheets may do so at the main circulation desk (they will be held until May 15th). Summer Reading is coming up in June for all ages. With the help of our chess master (Mark Papenhausen) and other club members, you can learn new strategies, face new opponents, and compete for the top rungs in our ongoing ladder tournament. For grades 6-12. New members are welcome any time. Refreshments are provided. You do not need to register for this event: you can just show up. Looking for something new to read? Join us the last Friday of the month. We'll discuss bestsellers, books we're currently reading, and books that are new at the library. Come for some coffee and a chat, 10am the last Friday of each month. The board meets at the library at 4pm on the third Monday of each month.